2017 is the 100th anniversary of the United States entering World War 1. 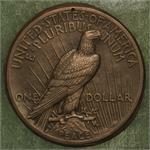 The Peace Dollar was first minted in 1921 to commemorate the “peace” following the end of WW1. But WW1 was an epic failure on the part of world leaders for letting it happen in the first place, and for mismanaging the aftermath which lead to WW2 and other problems which continue to this day. 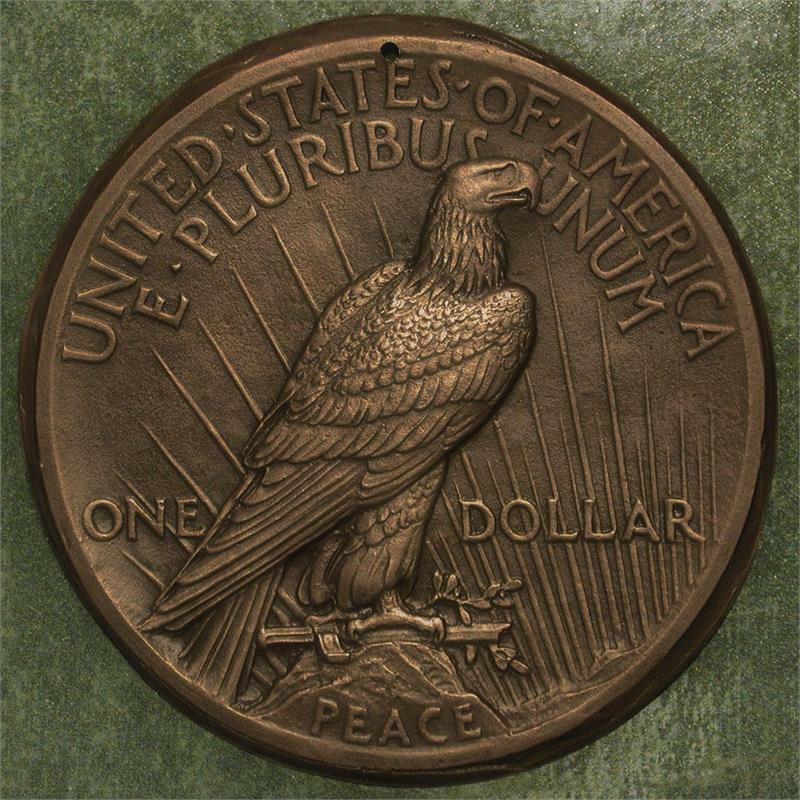 In prophetic fashion, the intended final design for the reverse of the 1921 Peace Dollar included the Eagle clutching a broken sword. At the time, most people felt that the broken sword symbolized defeat, not peace or victory. So the sword was removed from the master hub before the working dies or coins were made. A.) 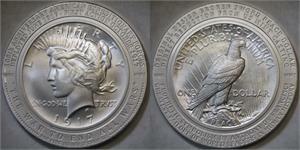 A design competition was conducted for the new "Peace" Dollar by the US Mint, with James Earle Fraser managing it. This was late in 1921 and time was already extremely short, given that the Treasury desired to issue the new coin before the end of the year. B.) One of the invited artists/sculptors was Anthony De Francisci. His initial submission consisted of one obverse design and two reverse designs. All three were submitted as plaster models, along with photographs of each. The obverse was similar to the final coin, except for having a Roman numeral date and slightly different facial profile. One reverse was similar to the final coin, but with a slightly shorter and narrower Eagle. The other reverse was significantly different and it showed an Eagle breaking a sword in its beak. C.) After reviewing the models submitted, the De Francisci design was chosen, with certain revisions desired. With Fraser's assistance, De Francisci prepared a new model for the obverse with a normal "1921" date (with dots on either side) and a modified facial profile. The reverse Eagle was made slightly wider and taller, the word "PEACE" was added to the crag below the Eagle, and a broken sword was added, laying horizontally and clutched by the Eagle. De Francisci's other (rejected) reverse design had a broken sword. It is not entirely clear what prompted De Francisci to add these two new elements to the reverse. The Commission in charge of choosing the design may have thought that the broken sword, in conjunction with "PEACE", adequately conveyed the message that the coin was supposed to present. D.) In New York, Fraser kept plaster models of the final obverse and reverse designs while De Francisci travelled to Washington DC on 19 December with identical plasters. These were shown to US Mint and Treasury officials, as well as President Harding. The designs were accepted by all. De Francisci telephoned the good news to Fraser. Fraser suggested that bronze casts be made from the fragile plasters he had in New York. One of each was made at a cost of $15 per. Presumably, the dots on either side of the date were removed from the obverse plaster before the bronze casting was made. A later (26 December) letter from Fraser to Mint Director Baker mentions "... an added expense of $30 for two bronze casts of the models of the Peace Dollar". I beg to advise you that we received at 2:30 P.M. today the plaster casts of both sides, and bronze castings of the obverse side of the models for the "Peace Dollar". The messenger who delivered these models stated to Mr. Morgan that Mr. Fraser said that the casting was poor, and suggested that we get an electrotype from obverse as well as the reverse side and if better than the one made in New York, to use it. Mr. Morgan is of the opinion that Mr. Fraser meant the casting was a little rough but he thinks it is not so much so as to give us trouble in reduction. The bronze casting of the reverse was a failure and we must now get our electrotype from the reverse plaster cast here. It would be impossible to get electrotypes of both sides and make our reductions in time to produce coins this year. Mr. Morgan is quite satisfied that he will be able to get a satisfactory reduction from the casting made in New York. Unless something unforeseen happens, and by using the New York casting, we ought to have dies for coinage by December 29th. That letter explains a lot. The New York bronze cast of the obverse was used in reduction to make the obverse master hub. An electrotype "galvano" was made at the Philadelphia Mint from the reverse side plaster. This galvano was used in reduction to make the reverse master hub (which included the broken sword). F.) News reports of the broken sword design resulted in a public reaction against it. The general sentiment being that it symbolized defeat, not Peace or Victory. Available time was insufficient to make a new plaster, casting, galvano or master hub without the sword. So De Francisci was asked by Fraser to travel to the Philadelphia Mint on 23 December and oversee Morgan's work on the master hub. Morgan carefully removed the sword from the one and only reverse master hub. A master die was then made from that hub and Morgan engraved some new details on that master die to fill in the area where the sword was removed. Working hubs, working dies, and finished coins were then made from there. Due to the additional transfers required to do this, it is possible that some detail was lost resulting in a generally soft appearance of the reverse on the struck coins. G.) Some time after the first coins were struck De Francisci made an additional plaster model of each side, possibly for sentimental and/or promotional purposes. These have slightly revised details (different than the actual coins) and they lack the broken sword. It is probable that the “failed" broken sword casting that Styer mentioned was not sent to the Philadelphia Mint and it likely remained in private hands. In late 2016 this casting, apparently, was discovered by Daniel Carr. It was being offered for sale on the internet by a “picker” who presumably picked it up at a garage sale or flea market. Shortly thereafter, it was acquired by Daniel Carr and Moonlight Mint. The full significance of the item was not initially appreciated by the parties involved. The casting exhibits detail and relief that is superior to any struck coins issued by the US Mint, including the 1921 “high-relief” proof issue. An image of the casting is shown above. The hole that was drilled in it may have been a way to mark it as rejected, as well as a hanging point for display by the owner. The reason that the casting was deemed a failure is unknown. But many things can go wrong. A casting can come out warped (coins made from it wouldn't stack very well). Or a casting could have localized imperfections such as galling, especially on steeper relief slopes. Although not severe, the broken sword bronze casting exhibits both of these defects. Bill Fivaz photographed the original obverse bronze cast on a visit to the Philadelphia Mint archives some years ago. Fivaz noted a somewhat rough texture on the obverse cast, which matches the texture of the reverse cast. It is interesting to note that he did not encounter any bronze casting of the reverse in the Philadelphia Mint archives. That fits with the Steyer letter, that the reverse bronze casting was not sent to the Philadelphia Mint and that is why it turned up in private hands later on. This “broken sword” casting was scanned in 3D at high resolution and used in a digital reduction process to produce the die which was used for the reverse of the “1917” fantasy-date over-strikes. Once scanned, the slight warping was corrected by straightening the scan. The original casting has a diameter of 7.5 inches. After an exact 1:5 reduction, the diameter of the die engraving is the appropriate 1.5 inches. With an identical 1:5 reduction of the relief height, the depth of the engraving is 0.030 inches, which is TWICE that of the actual 1921 “high relief” Peace Dollars produced by the US Mint. So it is apparent that even on the 1921 high-relief issue, the US Mint had already reduced the reverse side relief height by HALF of what was originally intended by De Francisci. The later low-relief Peace Dollars had significantly lower relief on the obverse, but only slightly lower relief on the reverse compared to the 1921 high-relief issue. The “1917” obverse was modeled after the 1921 high-relief issue and has the same obverse relief height. The reverse exhibits the FULL intended detail and relief (0.030”), as well as the broken sword. Hope you didn't miss this one!!! this is one beautiful token,if more are made I'll get another one. Very nice piece. I noticed toning on reverse at the rim from the 4 o'clock through 6 o'clock area. Still, not a show-stopping concern. This is the BEST item I've ever bought. The beauty of the dual high relief surfaces are so awesome it's hard to believe. If I could afford it I'd buy a dozen.